The New MIT Climate Study: A Real World Inversion? Considering that climate models are predicting global temperatures to be rising at a rate far greater than they actually are, you would think that the model developers would be taking a long, hard look at their models to try to figure out why they are on the verge of failing. In fact, I would expect to soon start to see papers in the scientific literature from various modeling groups attempting to explain why their models have gone awry and to provide an accompanying downward revision of their projections of 21st century temperature change. After all, how long a period of no warming can be tolerated before the forecasts of the total warming by century’s end have to be lowered? We’re already into our ninth year of the 100 year forecast period and we have no global warming to speak of (Figure 1). So imagine my surprise when a paper just appeared in the Journal of Climate by a group of researchers at M.I.T. that nearly doubled the existing expectations of the total warming by the year 2100! This is quite a gutsy group, for not only are they saying that the prevailing model projections—which are already way too hot—are warming things up too slowly, but that when they re-examine the model inputs, they predict a best-guess warm-up that lies very near the current worse-case projections. The research group led by Andrei Sokolov and Ronald Prinn expects that the most likely warming by the year 2100 to be 5.2ºC with a 90% confidence range bounded by 3.5ºC on the low side and 7.4ºC on the high side. Like I said, gutsy. Just to put that in perspective, I present Figure 2 which shows generally what the temperature rise during the next 90 years, 7 months needs to look like for that prediction to be true. Figure 2. 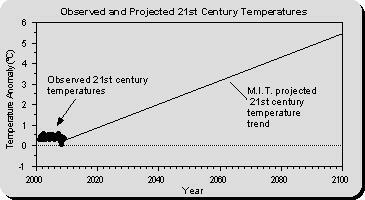 Observed and projected 21st century temperatures and trends. This is utterly incredible and virtually impossible. As a picture is valued at about thousand words, I probably couldn’t come up with a thousand more choice ones than Figure 2 is worth. So I’ll leave it at that. Climate science took another step backward last week as a new study from the Massachusetts Institute of Technology was announced which claims global warming by 2100 will probably be twice as bad as the United Nations Intergovernmental Panel on Climate Change (IPCC) has predicted. But as I have mentioned before, the use of statistical probabilities in this context is inappropriate. There is a certain climate sensitivity that exists in the real climate system, and it is true that we do not know exactly what that sensitivity is. But this does not mean that our uncertainty over its sensitivity can be translated into some sort of statistical probability. The use of statistical probabilities by the IPCC and the MIT group does two misleading things: (1) it implies scientific precision where none exists, and (2) it implies the climate system’s response to any change is a “roll of the dice”. We know what the probability of rolling a pair of sixes with dice is, since it is a random event which, when repeated a sufficient number of times, will reveal that probability (1 in 36). But in contrast to this simple example, there is instead a particular climate sensitivity that exists out there in the real climate system. The endless fascination with playing computer games to figure out that climate sensitivity, in my opinion, ends up wasting a lot of time and money. True, there are many scientists who really do think our tinkering with the climate system through our greenhouse gas emissions is like playing Russian roulette. But the climate system tinkers with itself all the time, and the climate has managed to remain stable. There are indeed internal, chaotic fluctuations in the climate system that might appear to be random, but their effect on the whole climate system are constrained to operate within a certain range. If the climate system really was that sensitive, it would have forced itself into oblivion long ago. [I]t is only a matter of time before the climate community placing all its bets on the climate models is revealed to be a very bad gamble. Update: Several commentors have asked to see a longer-term history of observations against which to compare the M.I.T. 21st century projections. Since the projections only cover the period from 2001 to 2100, I originally only showed the observations that thus far have occurred during that period (Figure 2). But for those want to see a longer perspective, I introduce Figure 3, the observed temperatures since 1900 along with the M.I.T. 21st century projections. To me, this doesn’t makes the projection look any better, but you can judge for yourself. Figure 3. Observed temperatures from 1900 through 2008 along with the 21st century projections from M.I.T. wait a minute.. how convenient it is for you to use only the last 8 years a benchmark..
wait a minute Justin… you need to look at the real climate SINCE predictions are made, not 50 years back (otherwise it’s call backcasting, not “prediction”). That is about 20 years, since for example the Hansen’s 1988 prediction in a senate testimony. 8 consecutive years wrong (or 11 years since 1998) for 20 year predictions, it’s at best unreliable, at worst “far out”. Would you trust a doctor who has misdiagnosed 8 out of 20 of his patients or a lawyer who has lost 8 cases over 20 but who assures you he’ll be right with the next 100 ? Following on the comment of Justin, I also suggest you include in Figure 2 the readings for the last 60 years. Failure to do so is akin to misleading the reader. I have updated the post to include Figure 3 showing the longer term observed temperature history (since 1900). Hopefully this Figure will add the fuller perspective that you were seeking. Wow, the MIT climate model bozos that Richard Lindzen has to work with is stunning, just like the slope of their projected temperatures. No wonder he is ‘battle-tested’ (and probably a little battle-weary). Honestly, how do the “script-kiddies” who come up with model results like this manage to retain funding? Amazing. The new figure #3 begs the question of how much of the warming in the last century or more is natural versus anthropogenic. So if Chip took a mid-range–say .4C–as anthropogenic and redid the graph, the slope of the increase in the MIT projection would come across as more striking. I assume the MIT warming is all anthropogenic. I agree with Justin and Gabriel about needing to include more data points. Thank you for posting that. One of the major problems I have with the studies that claim the sky is falling is that they seem to pick a year with a record low to start their study and and a year with a record high to end it (say 1975 to 1998). They then conclude that the earth will warm 11 C by 2100. I think, recently, that people have started to conviently pick the last 10 years to show that the earth is not warming at all, or in some cases even cooling. I do agree that we need to look at the recent data and compare it to predictions to see if those predictions are on course. In the case of this MIT study, it is relatively easy to see that the rate of change would have to increase beyond anything it has thus far. However, I don’t think people should get into the habit of picking convient dates to make outrageous claims as the other side of the argument has done for years. It didn’t advance science or the discussion then, and it won’t do it now. Chip – I’m not saying at all that you are doing that. It is just something I’ve seen happen, and which your aticle could mistakenly be interpreted to be doing (as it appears Justin and Gabriel did). And I also meant to say I think it was a great article, as are the others of yours I’ve read. I just recently found this site. I gave the paper a quick read. If I’m not mistaken, unlike the IPCC, the MIT group does not show a chart or tabular data to let anyone figure out if their projections are for non-linear warming rates. If so, it will be impossible to track how their projections are comparing to observations at all. We won’t even be able to make any specific comparisons at, say, year 2030. Have you found any such table or graph Chip? This is a dumb question but would not cost much to do. Could the people at MIT arrange to have a climate debate, record it and put it on YouTube? You have one of the most prominent skeptics and obviously some prominent alarmists on the same faculty and a debate between them would be enlightening and instructive for many. I don’t know the form of the MIT-expected warming, I showed a linear trend to give some idea, on average, just what kind of warm-up they are talking about. Sure, I guess that we could be on the exact track that they projected…no warming at all for the first part of the 21st century and then a rapid rise later, but that would even make the rate of rise, once it kicked in, even more outlandish. Thanks, Chip, for the new graph. Now the MIT bozos look even stupider. There is a good debate on youtube. Both sides presented. The whole thing is worth the time if you can spare it. At about 5:30 to 7:00 there is a discussion of the fit of models to current obserbed temps. The climate models would be the older models with slower warming. Don’t be surprised- if there is no global warming crisis, then these scientists would not get government grants and would have to get real jobs. You don’t know what it is like in the real work- people demand results. These scientists are just doubling down on their bet on the incompetence and ignorance of the American public and the politicians they elect. That’s a bet they are likely to win. The whole practice of creating models based upon inputs determined by the modeler’s (biased?) judgments and not tested extensively on new or “out-of -sample” data is worthless. This is a lot like the financial modelers who created models that got the risks of holding mortgage-backed securities all wrong. Its hard to believe that highly educated MIT scientists are making this mistake of grossly over-valuing the output of completely untested computer models of a such a highly complex, “noisy” system. They ought to know better. That they do not is amazing and disappointing.